Planning to move your home or business? From moving supplies to packing supplies, we have solutions to all your personal and professional self-storage and moving needs on-site. 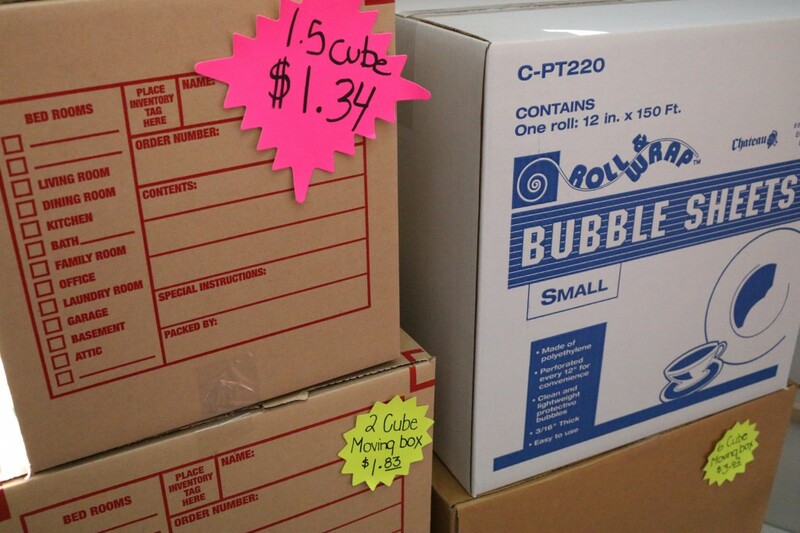 We carry a wide rage of moving supplies right in our site office, including: Wrapping Paper, Packing Tape, Tape Gun, Labels, Marking Pens, Utility Knives, Padlocks, Disc Locks, Bubble Wrap, shipping boxes, tarps and more. Why run around town to hardware stores to find your needed moving supplies when we supply them right on site! We’ve got you covered! When you choose Seaboard Self Storage for your self-storage, moving, small business and commercial storage needs, you have the peace of mind that all of your moving, shipping and storage supplies are right at hand. We can help you get from your door to our door, and from our door to your next destination or your customers, including ‘staging’ items for distribution or drop-shipping – even courier service! Whether it’s a moving checklist, moving boxes, shipping labels or packing supplies, everything you need is on hand at Seaboard to make your small business and self-storage experience as efficient and straightforward as can be! Our office hours are from 9am to 5pm, Monday to Saturday, and we are closed Sundays & Statutory Holidays.